Despite the recent years of scandal and sanctions, the men’s basketball head coaching position at the University Louisville is still one of the best gigs in the sport. Chris Mack leaving Xavier to take over at Louisville was the ultimate reminder that regardless of the circumstances there aren’t many jobs better. Mack was born and raised in Cincinnati and played for Xavier. In nine years with the program he landed a top ten recruiting class and earned a No. 1 seed in the NCAA Tournament. Those are two things that ten years ago we’d never expect to see from a program like Xavier. After proving that he’d gotten the program to the point where they can compete at the highest level and bring in top tier talent, Mack had no reason to leave Xavier. Until he was offered the Louisville job. If that alone isn’t strong enough evidence to indicate that Louisville is one of the top jobs in college hoops, we have more evidence. Jeff Goodman of the Stadium Network recently launched his “Conference Chain of Command” series in which we polled a handful of veteran coaches in every league to determine the best JOBS in each league, all the way down to the ones that are the most difficult. 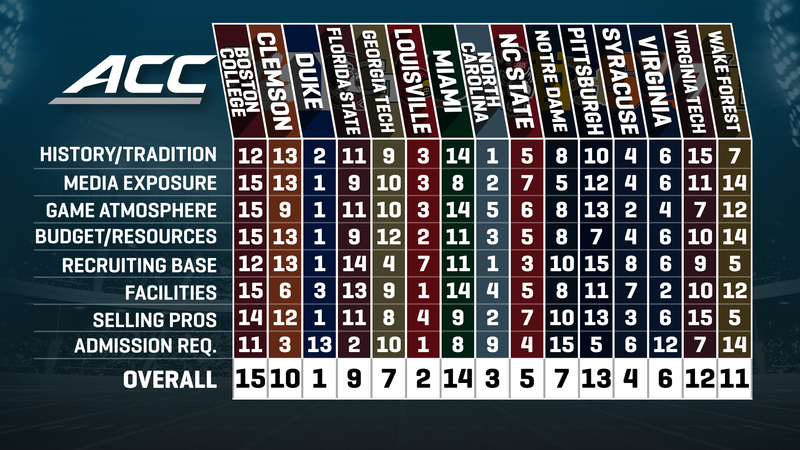 Louisville came in as the second best job in the ACC behind only Duke. 2. Louisville (104) – The Cardinals have won a trio of national titles — though the banner has been taken down from the last one in 2013 — and been to 10 Final Fours. Denny Crum went to a half-dozen of them and also went to 23 NCAA Tournaments with the Cards. Rick Pitino took over for Crum in 2001, and while there was plenty of off-court drama, he went to three Final Fours. Where they win: Elite facilities, incredible resources, big-time fan base, winning tradition and plenty of former and current NBA players. Here are the eight categories that were utilized to determine the overall rankings. In what world is Louisville a better job than UNC? What a joke – UNC has always been the best job in the ACC and maybe the country. Duke is 2nd but UL is not remotely close!